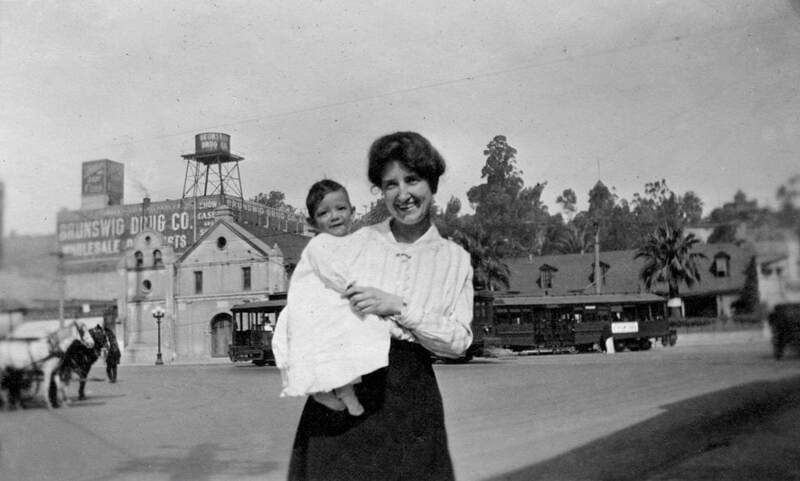 ​​​Celebrating 100 years, the foundation of Goodwill Southern California was established in El Pueblo de Los Angeles in 1916 by Katherine B. Higgins, the first woman to establish a Goodwill. Higgins was a pivotal figure in providing social services in Los Angeles and developing the La Plaza United Methodist Church. Goodwill adopted the philosophy “Not Charity, but a Chance” furthering the original mission of Dr. Edgar J. Helms, who founded the national Goodwill organization in 1902. 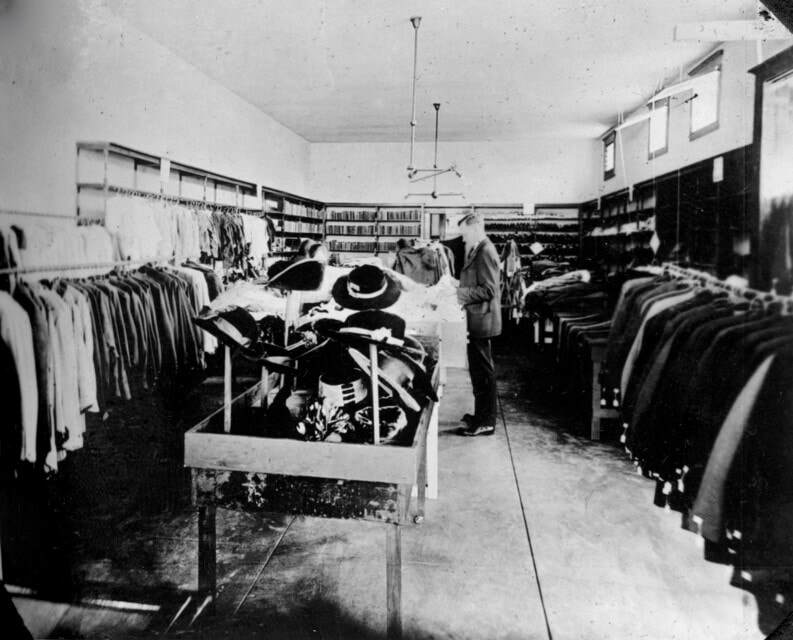 Higgins and the clergy of the Methodist Church opened the first store on the Plaza in 1918, offering discounted clothing and household goods. In conjunction with the Plaza Community Center, Goodwill provided employment and job training, welfare services and a health clinic to Latin Americans and other immigrants living and arriving in Los Angeles. ​​​Katherine B. Higgins (1880-1967) was the youngest of five children born in Bilston, England. After her father died in 1882, the family immigrated to Pittsburg, Pennsylvania. Later, the family moved to Elwood, Indiana where she attended the Central Business College in nearby Indianapolis. While in Indiana Katherine joined the Methodist Episcopal Church and decided to dedicate her life to the “Master for His service.” She successfully launched a girl's club, a boy's club, and a Woman’s Missionary Society. Katherine went to Chicago, where social work pioneer Jane Adams launched the Hull House settlement house, to learn about providing social services. Katherine is fondly nicknamed "Miss Goodwill,” "Mother of Goodwill" and the “Angel of the Plaza” for her social work. ​Dr. Vernon McCombs, Superintendent of the Latin American Missions, announced a need to have young women to perform welfare work among the 100,000 Latin Americans in Los Angeles. A teacher, Medora Hood, informed Dr. McCombs about her friend, Katherine Higgins. Kathrine accepted Dr. McCombs invitation to come to Los Angeles to work with the Methodist Church. Katherine declined an offer for a high paying position in the new Settlement House in Pittsburgh with the H. J. Heinz Company in order to come out West without a salary. Members of the South Pasadena Men's Class gave $15 a month toward Katherine's first salary. Katherine Higgins with her arm around her mother (Catherine or Mother Higgins), c. 1930. Reverend E.M. Sein, pastor at the Plaza Church, sits behind Mother Higgins. The Epworth League (a Methodist Association for young adults) was instrumental in helping to place the Opportunity bags in the homes of donors. Epworth League members transported filled sacks and took them to Bloom St. Katherine used the Epworth League emblem, a Maltese Cross, as the official insignia. In May 1916 Katherine and the Methodist Board of Latin American Missions negotiated for the site on the Plaza where La Plaza United Methodist Church stands today. 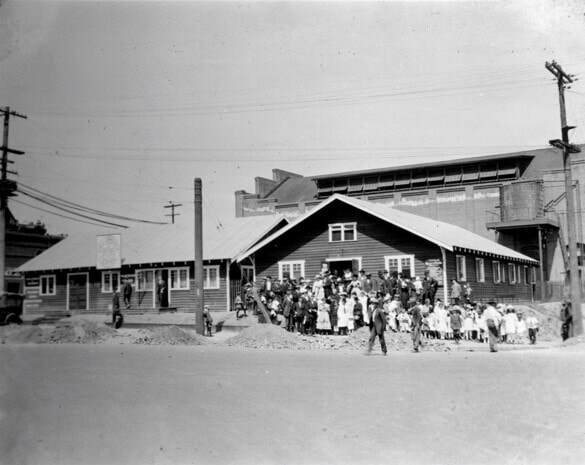 Two wooden portable buildings built in 1917 contained the Plaza Mexican Methodist Church and the Plaza Goodwill Store, which offered medical, dental, employment, and general welfare services. The back lot was used for a day nursery and kindergarten. 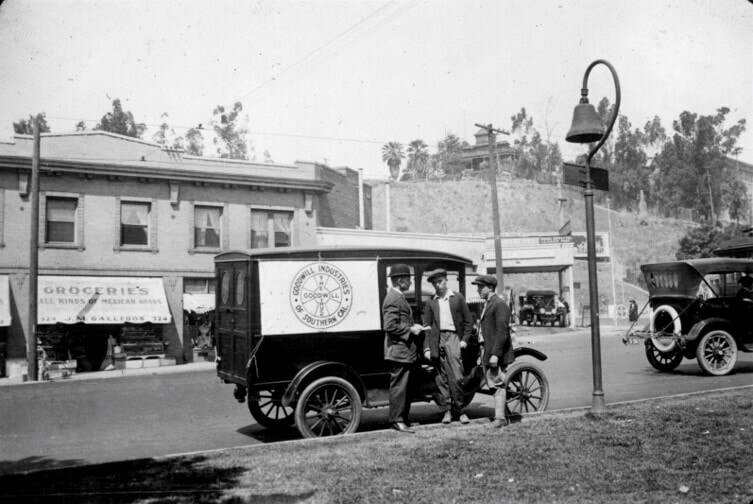 ​On March 9, 1918 the first Goodwill Store opened in one of the portable buildings in the Plaza Community Center on Marchessault St., presently the southern end of Olvera Street on the Plaza. During a time when the City’s facilities were segregated the water fountain, in the background, was a symbol of “brotherhood” where anyone of any race could freely drink. Repairing and selling donated items funded the activities, programs and social services provided by Goodwill. Today, the services and programs are funded by retail sales, business contracts including e-Recycling and document shredding, government grants and contacts, and private philanthropy. 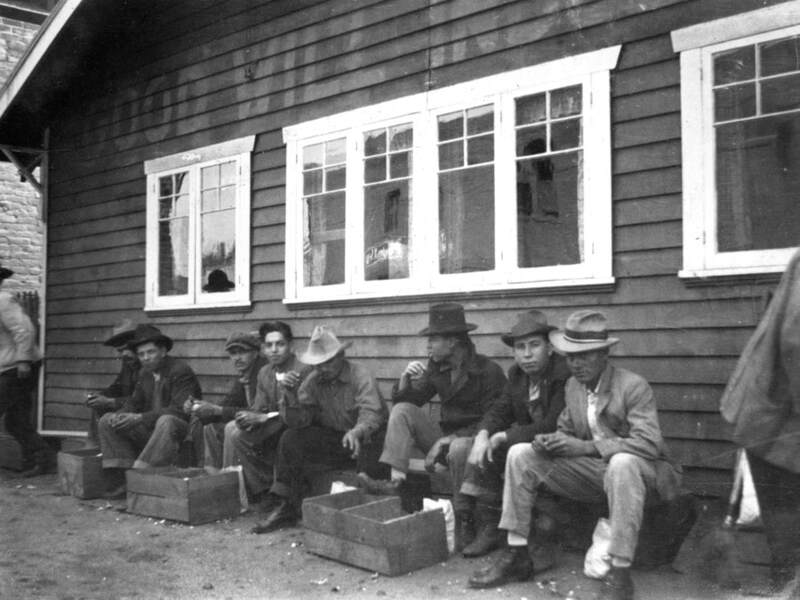 Men sit by the side of the Goodwill Industries Store, c. 1918. In 1919 Goodwill acquired their first Ford truck to transport Opportunity Bags. In April 1919 Goodwill Southern California (GWSC) was organized under the Bureau of Goodwill Industries of the Department of Cities of the Board of Home Missions and Church Extension. GWSC separated from the Latin American Mission in 1921 to become more secular and place a greater effort in reaching all denominations, classes and races.